Sometimes I find it hard to decide which is I like better, Melting Moments or Mexican Wedding Cakes. 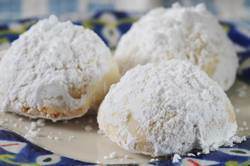 Both are round balls that are coated with confectioners sugar, and both are a shortbread-like cookie that rely on butter for their wonderful flavor. But there are a few differences between these two cookies; one is that Mexican Wedding Cakes contain ground nuts, and the other is that Melting Moments replace some of the flour with cornstarch (corn flour) so the cookies literally "melt-in-your-mouth". Melting Moments are easy to make and are perfect for those who like to do their Christmas baking early. They store very well, up to two weeks, but since they are so fragile I wouldn't advise shipping them. As far as the ingredients go, because there are not a lot of competing flavors in this cookie this is one time when buying a good quality unsalted butter is advisable. Also, use 'pure' vanilla extract not the ones that are labeled 'imitation' as they are made with synthetic vanilla (from glycoside found in the sapwood of certain conifers or from coal extracts) and leave a bitter aftertaste. The best pure vanilla extract I have found, although it is quite expensive, is Nielsen-Massey Madagascar Bourbon Pure Vanilla Extract that can be found in specialty food stores and by mail order. If your budget doesn't allow this expenditure or you cannot find it, don't worry, there are quality brands to be found in your local grocery store. Incidentally, you may have seen Melting Moments that look very different from the picture above. Sometimes the dough is placed in a piping bag with a fluted tip and then piped into rosettes. The finishing touch is to top each cookie with a red or green candied cherry. Other times the dough is rolled into a crescent shape with the ends sometimes dipped in melted chocolate. Note: For those unfamiliar with cornstarch it is a fine white powder that comes from the inner grain (endosperm) of corn and is used by many as a thickener for gravies and sauces. The British term 'corn flour' is often used synonymously with the North American term 'cornstarch'. Melting Moments: In a medium sized bowl whisk together the flour, cornstarch and salt. In the bowl of your electric mixer (or with a hand mixer), beat the butter and sugar until creamy and smooth (about 2 minutes). Beat in the vanilla extract. Add the flour mixture and beat just until incorporated. Cover and refrigerate the batter for an hour or two, or until firm. When batter is firm, form into 1 inch (2.5 cm) balls and place the cookies on the prepared baking sheets, spacing about 1 inch apart. Bake for about 10 - 14 minutes or until the edges of the cookies just start to brown. Remove from oven and place on a wire rack to cool for about 3-5 minutes. Transfer the cookies to a wire rack that is placed over a sheet of parchment or wax paper. Put the confectioners sugar in a fine strainer or sieve and sprinkle the tops of the cookies with the sugar. These cookies store very well. Place in an airtight container between sheets of wax paper and they will keep a couple of weeks. If desired, just before serving, sprinkle the tops of the cookies with confectioners sugar.